I love Seattle. I’m proud to say that I’m a born and raised Seattleite (well, Seattle-adjacent.) I love our trees, ferries, rippling streams, and coffee shops. But what I’m most proud of is our fabulous small businesses. 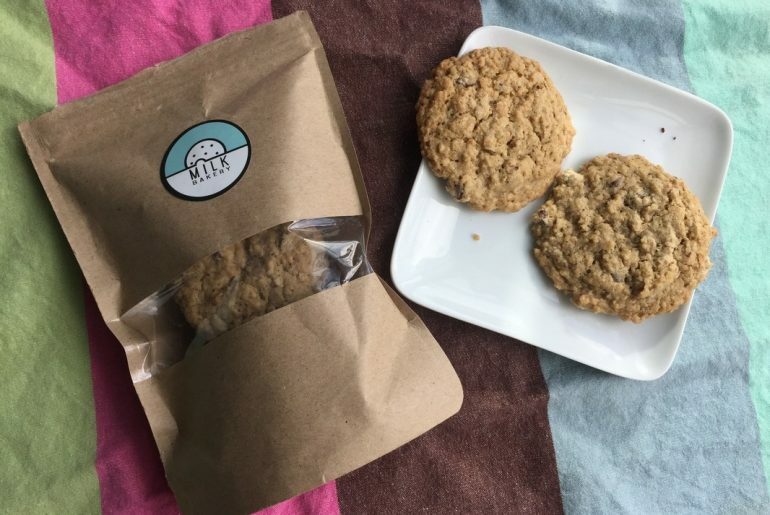 When I heard that Milk Bakery (a new online bakery) was opening in Seattle and offering lactation cookies and granola bars, I immediately contacted them to see if we could collaborate. 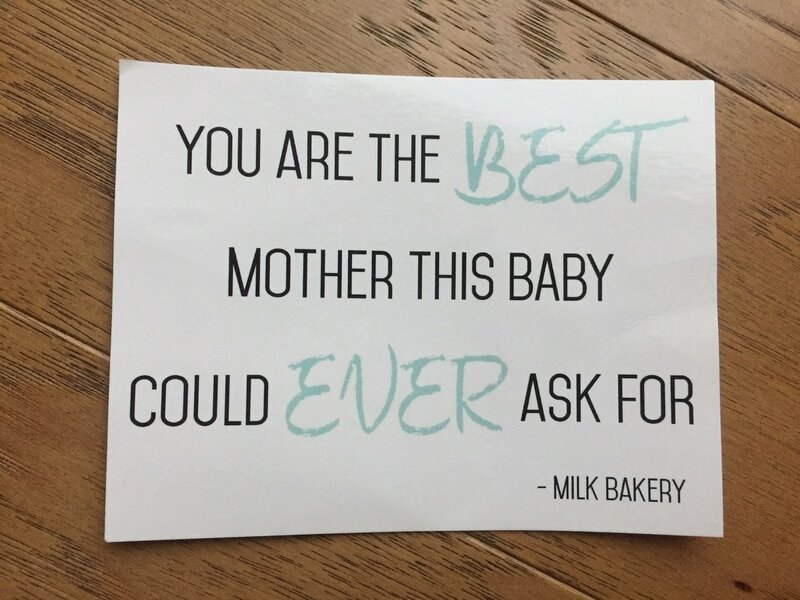 Milk Bakery believes in “Judgement Free Breastfeeding.” I really love this because I was caught off guard how many people commented on how I fed my oldest and wanted to know how long I’d keep breastfeeding. They make cookies for breastfeeding moms, formula feeding moms and all moms in between. I especially love this because I remember how hard it was to eat anything with I had my oldest son. I was just so busy and overwhelmed and by the time I would have a few moments of quiet, the last thing I wanted to do was make myself something to eat. So I just didn’t eat. This time around, I’m making it a priority to eat. I’ve always been intrigued by lactation cookies. I’ve tried Mother’s Milk Tea in the past, which has helped my supply. So many Mom friends swear by lactation cookies. Others say they didn’t help their milk supply. I love that Milk Bakery says on their website: “If our delicious cookies and granola bars help you produce milk, great. If they don’t, eat them anyway because you deserve a treat.” This is a statement I can get behind! Here are the Coconut Oatmeal and Oatmeal Chocolate Chip cookies. I tore into the bags before taking this photo because I couldn’t wait to try! Kate, the owner, was kind enough to drop the cookies off at my husband’s work so I could try them out. My husband had just left for lunch, so he had his co-worker pick them up. She also is a nursing Mom, so I told her to have the first taste. Her first impressions were that they were super crunchy, which surprised her. She was eating them at her desk and it was getting a bit messy. She popped one in the microwave for a few seconds to soften it and they became a lot chewier. She suggested pairing it with Mother’s Milk Tea for a nice tea and cookie treat. I got a text from her later that evening and she definitely noticed a difference in her milk supply, which surprised her because she’s been nursing for quite awhile. This is the Oatmeal Chocolate Chip cookies from Milk Bakery in Seattle. I decided to try my first Milk Bakery cookie for breakfast with my coffee. I tried to Oatmeal Chocolate Chip. I popped it i the microwave for 12 seconds and it was nice and warm and chewy. I loved the flavor! The oatmeal definitely came through and it tasted more substantial than other cookies. READ Inglesina Foldable High Chair: Take it or Leave it? Then about an hour later, I tried the Coconut Oatmeal for my second breakfast. I was surprised just how much the coconut flavor came through! I’m a Hawaiian-cookie addict (just ask my husband) and this rates right up there with some of my favorites! About an hour after my second cookie, I noticed some tingling after I fed my son. When I fed him a few hours later, I definitely felt fuller than usual. That evening, I was able to pump 4.5 oz. I pump every few weeks so I was happy to get that much. However, my son was going through a “leap” and was nursing more frequently, which might have led to me producing more milk. 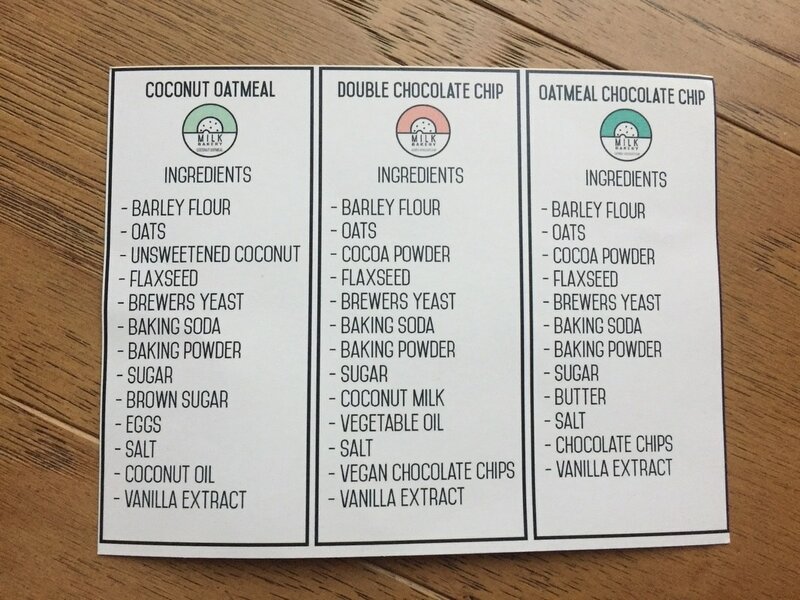 My cookies came with this handy ingredient card which is helpful for Moms and babies with food allergies and sensitivities. I did not try the Double Chocolate Chip, but I was really glad to know she offers a vegan cookie. Not because I’m vegan (I’m not), but because I know a lot of breastfeeding Moms who have to eat a strict diet because their baby has allergies. Sometimes those Moms end up going straight to formula because it’s hard to maintain a strict diet. Vegan options are great for Moms who’d like the option to continue breastfeeding. I really love the reaffirming messages Milk Bakery puts on their products and website. The cookies were so tasty that it was really hard for me to limit myself to just 2 a day. But, I wanted them to last a bit longer. I was able to pump 4.5oz-5oz of milk once per day every day I had the cookies. Usually when I pump, my son cries likes he’s not getting enough milk for the next 2 feedings. However, the days I ate the cookies, he seemed happy and full after each feeding. I can’t say for sure that it was the cookies. The 2 bags of cookies lasted me a week (eating 2 cookies per day.) I made a point of sitting down and enjoying my cookies with my coffee each morning. Regardless of whether or not it helped my milk supply, it was really nice to set aside something that was just for me each day. 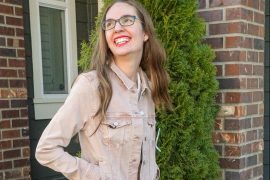 It was the little bit of self-care that I needed to survive the craziness of raising a baby and a preschooler. 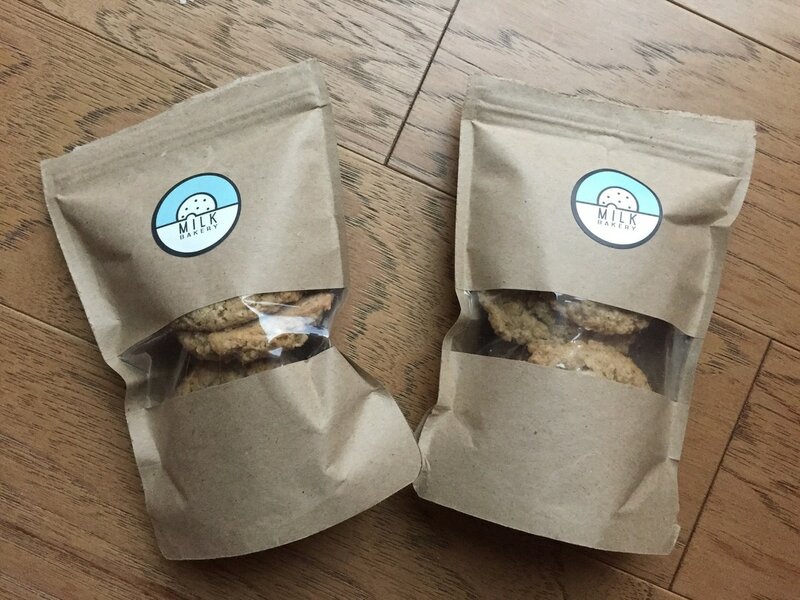 If you’d like to try Milk Bakery, head to their Etsy Store to purchase their cookies. 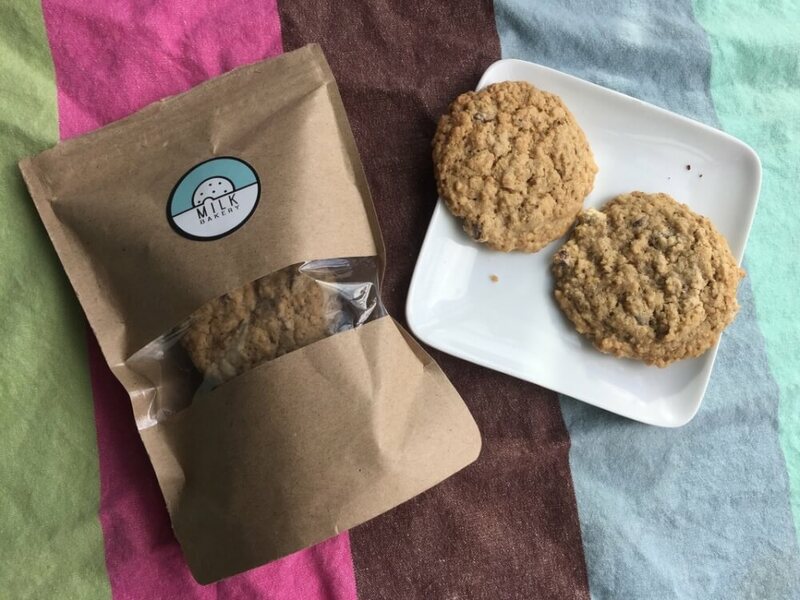 Milk Bakery sent me their lactation cookies for review purposes. All opinions are my own. It’s a shame they’re not gluten free, they look great! They are so yummy! I’m sure someone makes a gluten-free version. This is such a great treat for nursing Mamas. We just stopped nursing, but I’m sure this also helps the anxiety of worrying if you are producing enough. Yes, I think so much has to do with the anxiety! With my oldest, I stressed myself out so much over my supply! Yes, I only heard about lactation cookies when I was pregnant. They are for everyone, not just nursing moms. These cookies look very delicious! Too bad I live outside of the US so I would just have to watch them and drool. Looks healthy for the kids too! Yep, they are tasty for the whole family! These sound great! I tried a different brand of lactation cookies while nursing my son and they weren’t very good. I’ll have to keep these in mind for Baby #2! Also, good for you for nursing your little one as long as it was working for the two of you! That’s all that matters! This looks so tasty and delicious. Unfortunately I live in the UK and I do not think they sell them here. 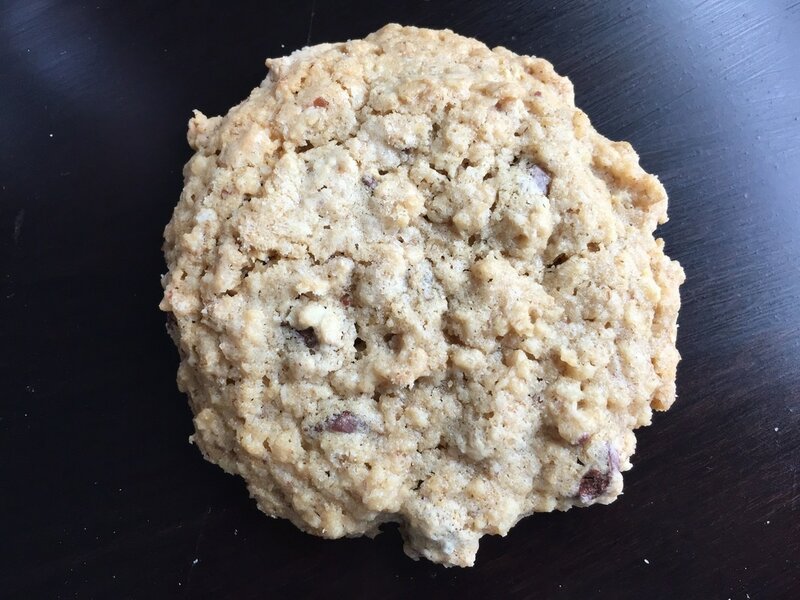 Maybe lactation cookies are just a U.S. thing? I’ve only heard about them since I was pregnant with my oldest. Yes, we are so lucky with all the cool Seattle-area businesses! I wish I would have known about these when I was still nursing! I really wanted to try some out, but never found any locally. I didn’t really think about ordering some online! Yes, me too! As soon as I saw that she was local, I jumped at the chance to try them! I was a formula feeding mom, but like you said – all moms like cookies, right? You can’t go wrong with a cookie. At first when I read the title I thought ok that is strange to put breast milk in cookies. But yes now I see it is to help mamas milk supply. It is a shame they are not gluten free, I see they are dairy free which a lot of nurslings react to. I love this wonderful support of nursing Mamas! When you struggle with your supply, it is so disheartening. I also tried Mother’s Milk tea, but man would I have loved cookies! You don’t have to eat those up (unless you want to) and you can take them on the go. Sounds great to me! Yes, I sometimes eat them in my car when I’m dropping my oldest at preschool. So yummy! I am gonna try this cookie. Thank you for sharing, this is a great snack. This is the first I’ve heard of lactation cookies. I had low supply with my first and used the Mothers Milk tea. It helped a little. You wouldn’t have had to ask me twice to try out a cookie! Luckily, I didn’t have the same issue (undiagnosed hypothyroid) with the next three. But, you still wouldn’t have had to ask me twice to try the cookie! Yes, I’m not one to turn down a cookies, either! They are pretty tasty and it makes me feel like I’m helping my supply. This is such a cool idea. I love that she doesn’t make claims that the cookies will definitely increase milk supply — but it sounds like it did help you and your friend so that’s great. Yes, I’m always skeptical when people claim to have the magic answer for things. Everyone reacts differently and I’m glad they are working for me! I like to think of them alongside amber teething necklaces. So many people swear they are the answer, but I didn’t think they did anything. You just never know. not a mom, it’s interesting seeing that their are products out there to help mothers and taste good. What an interesting concept for a cookie. Yes, they are yummy and anyone can eat them! I tried to make some of these when I was nursing my son but they were awful. I wish I would have known about these! Exactly! I think there are a lot of dud recipes out there. Milk Bakery figured out how to make them really yummy! I’m past this phase of life now, but I can totally support this concept! I just went heavy on the oatmeal and liquids when I needed to, but this looks more delicious. I tried just doing oatmeal with my oldest and that got old fast. I didn’t even think about oatmeal cookies! Yes, it’s definitely something to keep in mind! Feel free to check out my blog for other useful items for new moms and babies! These look awesome, I had the opposite problem when I breastfed my son, I was hungry all the time and felt like all I did was eat! No matter what you do, people are going to judge you so I just like to think we do what’s best for us and let haters hate! Yes, I’ve never felt so judged! Good for you for making sure you were eating enough! This is such a great niche product, it is so nice to see that nursing moms are not ignored and it is great that you keep it going for your older child. 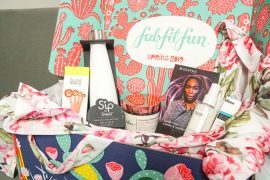 Yes, it’s been fun to see products geared specifically for nursing moms! Yes, online is the best! These looks so yummy! they have a lot of the ingredients that I love!!! Thanks so much for sharing! They are very satisfying cookies! If nothing else, it reminds me to eat something yummy! They WOULD make a great after-gym snack! These look so yummy. I had such a difficult time with breast feeding and just could not get my milk supply to come in. These would be such a wonderful drop-off gift for new mommas. I wasn’t a fan of the tea, so I love that there’s an option that are COOKIES! I’ve never heard of lactation cookies before. These seem interesting. It’s a fun idea for new Moms! I wish i knew about delicious cookies like this when i was nursing my boys. It never seemed I made enough milk to keep them satisfied. I took fenugreek capsules for awhile but these cookies would be much better! So many Moms struggle with breastfeeding so I love that these cookies are an option. This is something new. I bet that is great for you and your son. I like the innovation behind this. I’ve only heard about them since becoming a Mom. These look as good as they sound interesting. I would have loved these in my nursing days. I had no idea that something like lactation cookies existed. That is so cool that there are cookies that can help mamas in this way. Such a great idea. It is hard to find the time to eat as much as you need to when breast feeding. All Moms need a treat too!